ROG Strix GL702VI is the gaming laptop that includes NVIDIA GeForce GTX 1080 graphics, Windows 10 Home, latest 7th Generation Intel Core i7 processor and a tremendous 120Hz G-SYNC panel. 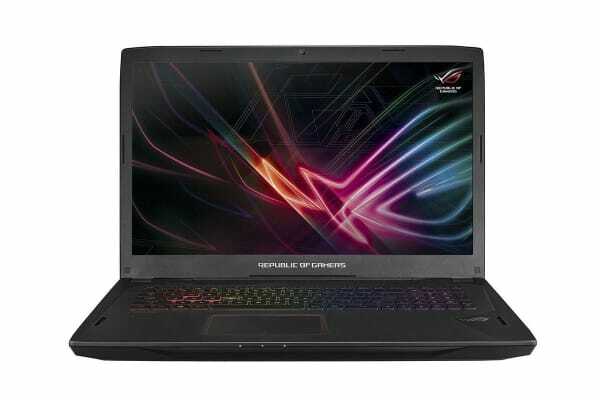 Loaded with premium components and styled to impress, ASUS ROG Strix GL702VI is the all-conquering companion for every gaming adventure! Experience unbeatable performance with a 7th Generation Intel Core i7 quad-core processor and discrete NVIDIA GeForce GTX 1080 graphics, with Microsoft DirectX 12 support – plus NVMe PCIe x4 for blazingly fast SSD data transfers. This powerful combination delivers everything you need for today’s fast-paced games and for multitasking! The super-fast 120Hz wide-view panel on the Strix GL702VI includes NVIDIA G-SYNC technology for synchronizing refresh rates with its awesome GTX 1080 graphics card. This eliminates visual tearing and drastically reduces lag and frame stutter to deliver smooth and fast gaming graphics – without affecting system performance! Strix GL702VI is equipped with a four-zone, Aura RGB-backlit keyboard with chiclet-style keys and a demarcated WASD group for fast, accurate control – even in the dark. And these keys don’t just look good: The refined aesthetic is backed by precisely engineered scissor switches with 1.8mm travel, for keystrokes that feel great and hit their mark, every time! NVM Express PCIe 3.0 ×4 enables superfast data access speeds, so you’ll spend less time waiting and more time gaming! Through clever optimisation of hardware and software, Strix GL702VI with an NVMe SSD provides extreme read speeds of up to 3000MB/s. That’s up to 4.3X faster than PCIe x2 and an astonishing up to 35X faster than traditional hard drives! 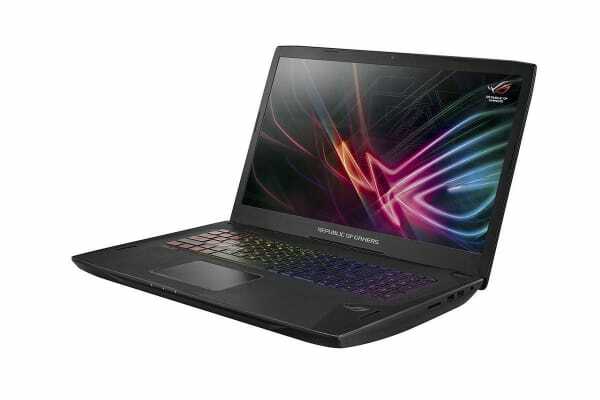 Strix GL702VI uses heat pipes and a dual fan system to cool the CPU and GPU independently. The pair of 12V fans increase air flow through the chassis by 35% and maximise cooling efficiency to provide stability for intense gaming marathons with GTX 1080 graphics. The VR-ready NVIDIA GeForce GTX 1080 GPU in the Strix GL702VI drives demanding virtual-reality games with great speed, supreme smoothness and without stutter – immersing you convincingly in an infinite number of other worlds. Strix GL702VI includes stereo speakers that are carefully engineered and arranged to deliver crisp, clear and powerful audio. Built-in smart-amplifier technology monitors audio output and makes real-time adjustments, so you can pump the volume up to the max without worrying about damaging the cones. Strix GL702VI also includes Sonic Studio software, with in-game noise cancellation, voice-volume stabilisation and Sonic Radar – an innovative on-screen overlay that helps you detect opponents by displaying the relative positions of gunshots, footsteps and other in-game sound effects! 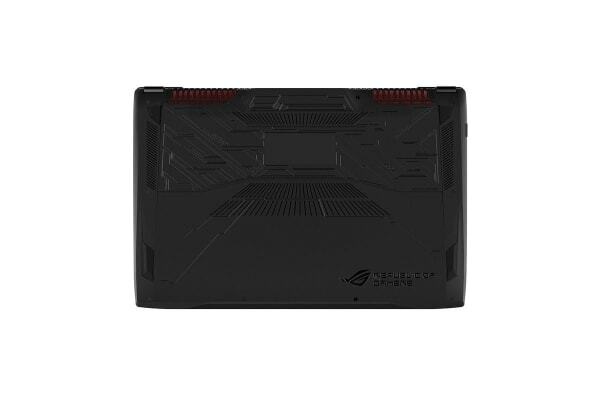 Strix GL702VI is stacked with great connectivity, including a Mini DisplayPort – a small, simple connector that makes it quick and easy to attach a larger external monitor for even more gaming immersion. We’ve placed most of the ports on Strix on the left-hand side, keeping the space on the right free for those frantic in-game mouse actions! ROG Gaming Centre allows you to launch ROG applications and easily access settings. Strix GL702VI also includes GameFirst IV technology to optimise network traffic for faster, lag-free online gaming.